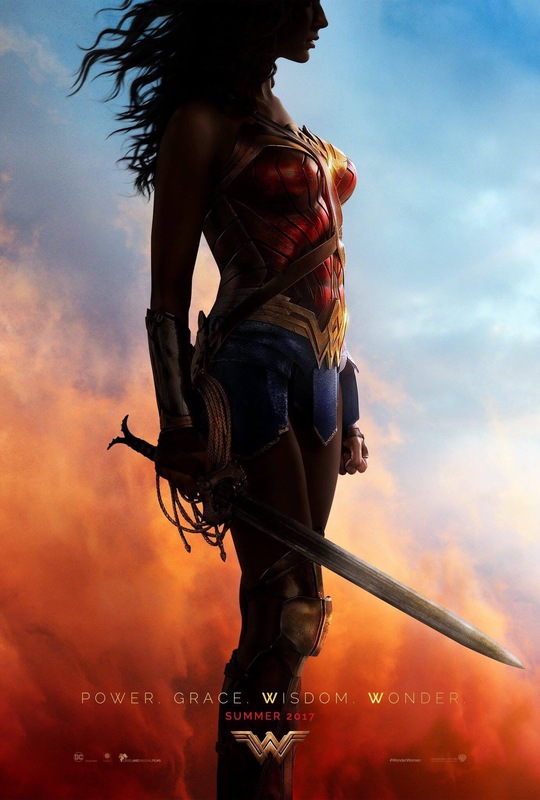 Of everything that has come out of Comicon; Dr Strange trailer, Justice League preview, Wonder Woman trailer, this is the most exciting news for this little comics and movies fan. After much speculation, the actress playing her will be Kong Island and Scott Pilgrim Vs the World’s Brie Larson!! 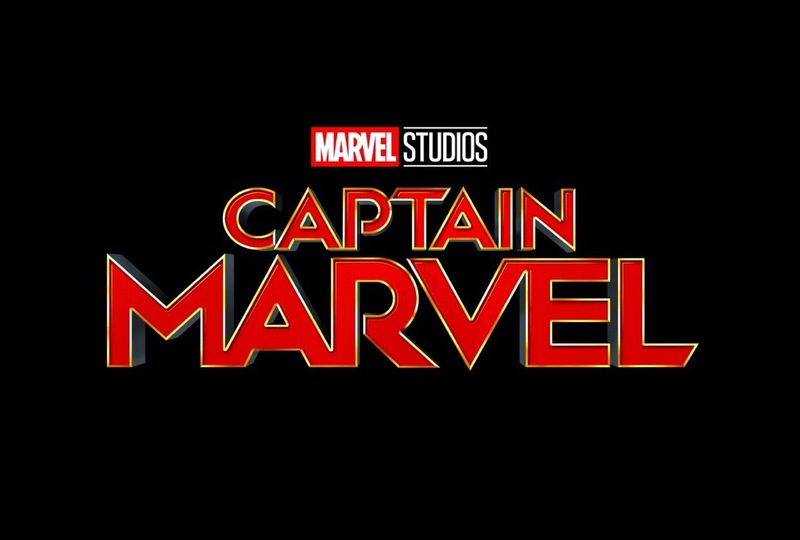 Captain Marvel was created as an effort by Marvel to diversify their character line up in the seventies when they started with several black characters such as Black Panther and Luke Cage, then Asian characters such as Shang Chi and then started with female versions of Captain Marvel (Ms. Marvel), the Hulk (She-Hulk) and Spider-Man (Spider-Woman). 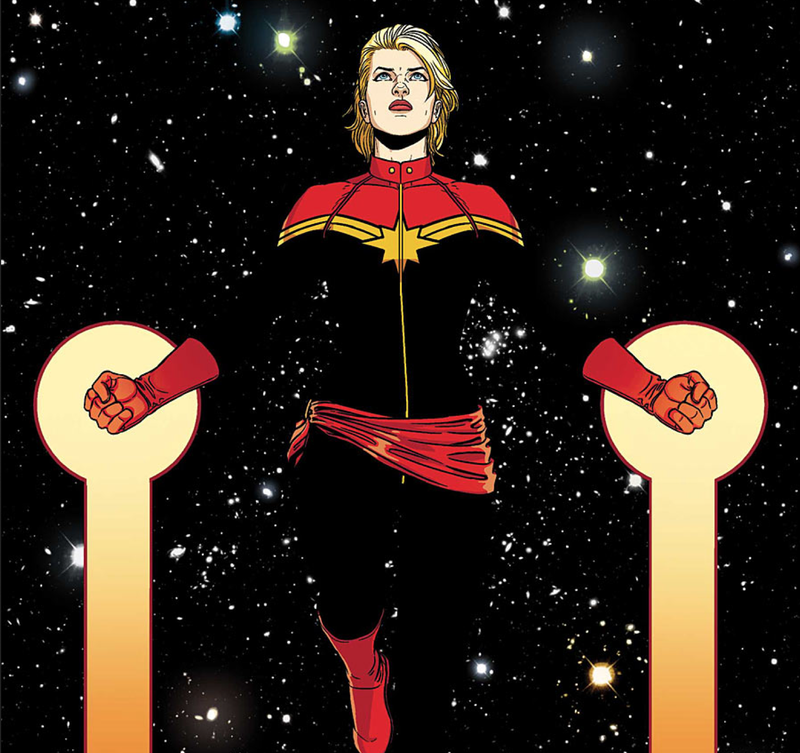 Ms. Marvel, after several name changes such as Bi art and Warbird, became Captain Marvel in the comics in 2012. I am pretty excited about this as as a comic collector, my back issue hunts are usually for short run seventies books, and Ms. Marvel was one of those I loved from the period. I wish Brie Larson a lot of luck in her endeavour portraying the character. The movie has a projected 2019 release. If you like genre based podcasts, you should be listening to the podcast made by our mate’s over at the Director’s Suite Cast. You can listen to them directly at their site The Director’s Suite Cast or search for them on iTunes, and download it. It’s a great listen, entertaining and informative! I’m really looking forward to this film, and this poster is just fantastic! I want one! 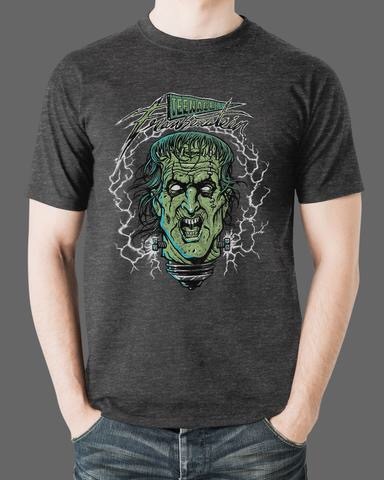 Fright Rags – On Tour and Screaming! Well my favourite clothing company have done it again! 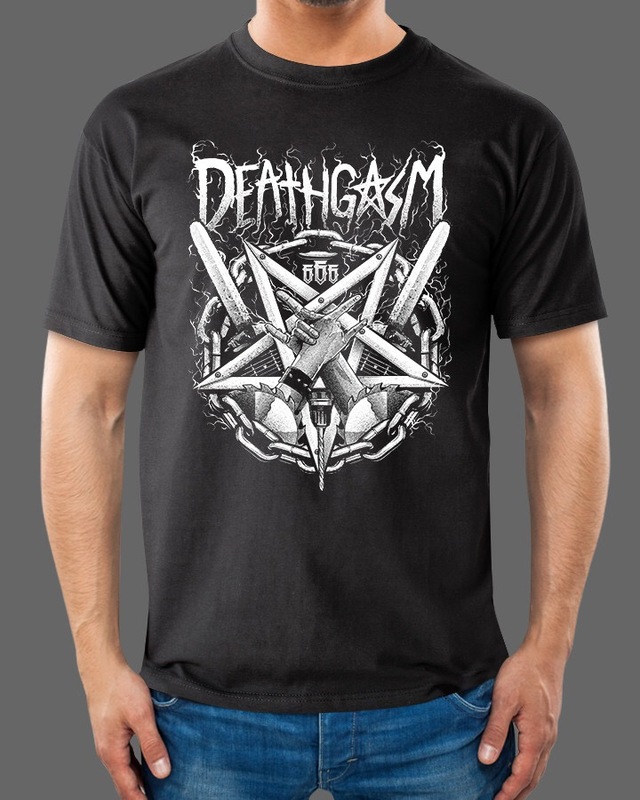 A new bunch of shirts that will no doubt make it into my wardrobe of doom. 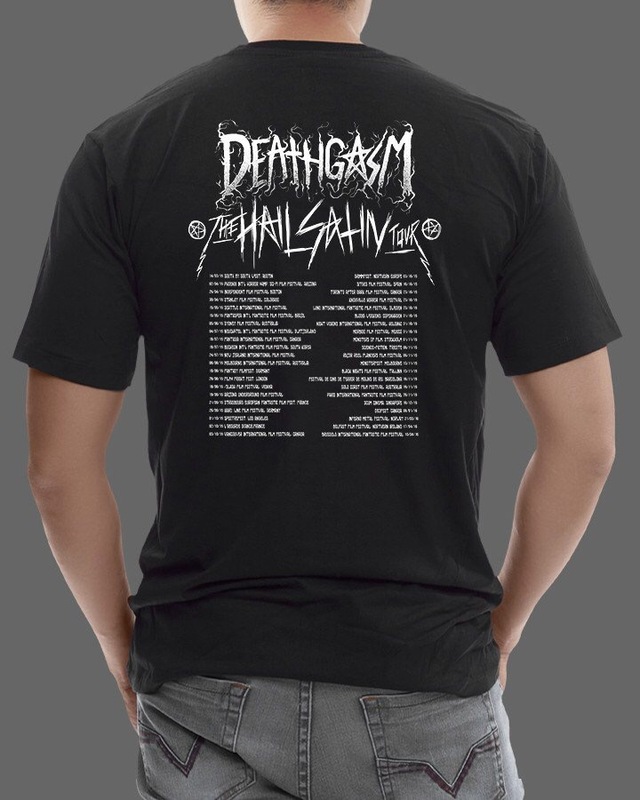 The Deathgasm shirt is available now! Now send your mind back to 1996 when Wes Craven saved horror from becoming the new western, and all but disappearing from cinema altogether. 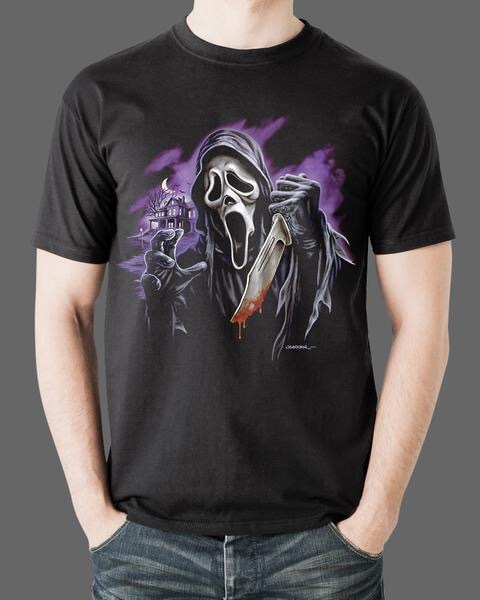 He created another definitive horror icon in Ghostface, and… It’s about time… His iconic Edvard Munch-ish ‘Scream’ Ghostface masked killer will be available on T shirts as of 27th July. Honestly I don’t know how I’ve survived this long without one! 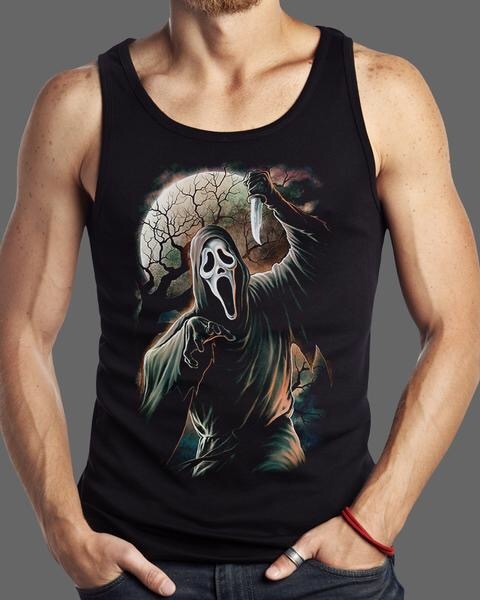 As ever there ARE other designs available button see them you need to visit Fright Rags!! Film: I have a very special place in my heart for the work of Lucio Fulci. Why? Because he’s freakin’ AWESOME! I was brought up on some of his films on VHS, specifically The Beyond and City of the Living Dead, and since the advent of DVD and Bluray, I’ve been able to expand my exposure to his work, and even though there are several missteps, and a lot of nutso stuff pumped out of his factory, I have a great affection for it all. Ok, I’ve gotten the fanboy stuff out of the way, now for the ‘professional’ review, and I’ll point out that even though I like watching his films, I am well aware of the shortcomings of some of them. 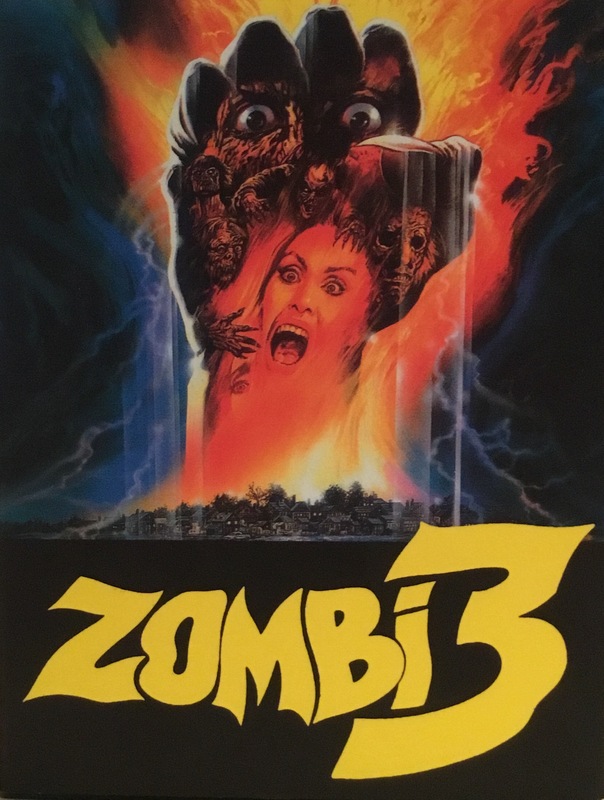 This film, known as both Zombi 3 and Zombi Flesh Eaters 2, is a real item of its time. It riffs on so many films, such as Return of the Living Dead and The Crazies, but doesn’t have the budget, or talent either in front of the cameras, or tragically behind them. This film was written by Claudio Fragasso, though IMDB mentions Rossella Drudi who wrote Troll 2, and this is such a dog’s breakfast I see no reason why that wouldn’t be true, but her involvement isn’t the only reason for this film’s confusion. 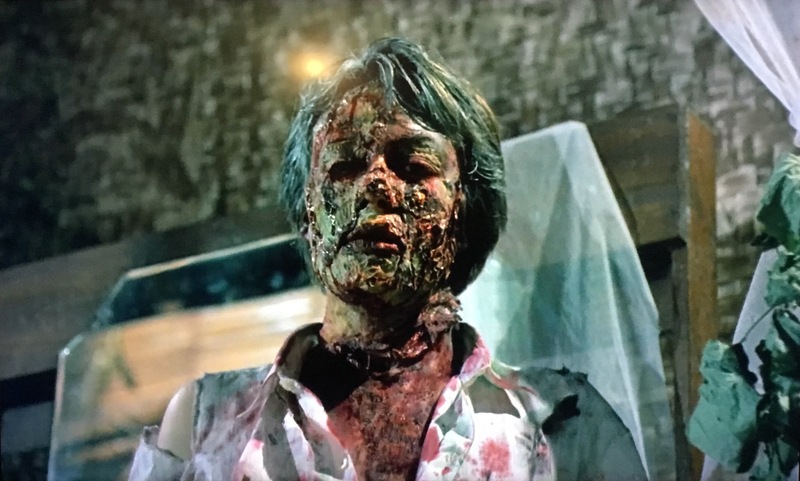 Fulci had a stroke during production, and the directorial reigns were handed to both Fragasso and second unit director Bruno Mattei, who dumped some of Fulci’s 70 minute cut, taking it to 50 minutes, and added 40 minutes of their own footage. When a toxin is stolen from a research lab, it accidentally infects the thief. The toxic dies once airborne, but when transfer from human to human, via blood, or breath (hang on, isn’t that ‘airborne’?) or saliva, or other gooey, mucusy bits, it turns the infected into a violent, zombie-like crazy. The original thief is found and his body destroyed by the army in a crematorium, but the doctor’s inform them that this was a stupid idea as the smoke could transfer the virus… You know, airborne (as fire cause it to mutate, obviously)… and infect even more people, or…um… Birds. Ok, so there is so much wrong with this film. The cinematography is terrible at some points, one in particular is a car hood mounted camera looking into a windscreen that has a strong reflection on it, completely obscuring the occupant of the vehicle. Some of the dialogue is either completely crap, or ‘borrowed’ directly from Return of the Living Dead, also stolen from ROTLD is the way some of the music cues are presented: actually ROTLD is a source for a lot of the film. Especially fun is the acting… Well, the over-acting. 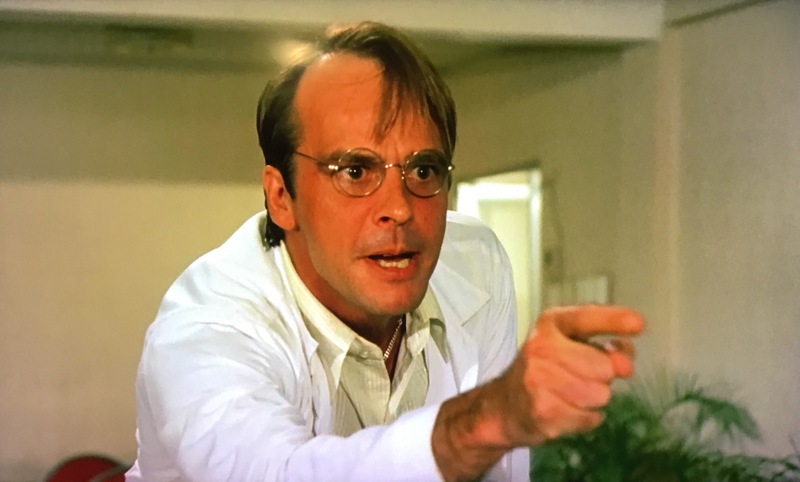 The main Doctor character acts like he is in a Power Rangers outfit: you know what I mean, hands waving around, head wobbling and you know what a William Shatner impersonation sounds like? Well he talks like that! In spite of, or maybe (probably) because of these reasons it’s actually entertaining. I mean, your mate who loves big budget, world destroying CGI fests is not going to find much here to enjoy, but you spaghetti-loving, Italian film fans are gonna roll their eyes in ecstasy. Be warned: this isn’t a good film, it’s a fun roller coaster! Format: The film was reviewed as a part of 88 Films’ ‘The Italian Collection’. It is a region B Blu-ray Disc presented in 1.66:1 widescreen with a LPCM 2.0 track, both of which are pretty good. Extras: Wonderful extras live in this two disc set. 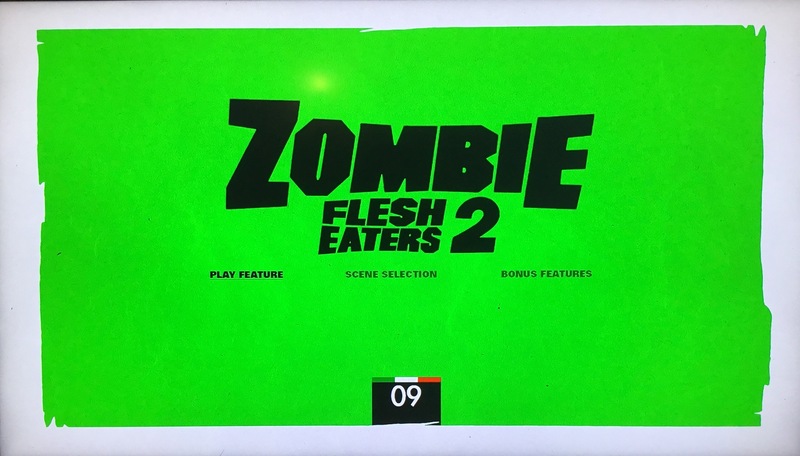 The first disc gives us alternate Italian opening and closing sequences, interviews with Dell’acqua (in a piece called Veteren of the Living Dead) MacColl (in a live Q & A with terrible sound), Ring (Zombie Reflections which is more a stills gallery with a voiceover about her career played over it, nothing wrong with that but again, the audio is substandard) and Fragasso, and a trailer reel featuring Children of the Corn, Don’t Go In The Woods, Hollywood Chainsaw Hookers, Live Like A Cop, Die Like A Man, Mother’s Day, Slaughterhouse, Trancers and Splatter University. The second disc, called ‘Paura: Lucio Fulci Remembered’ is a collection of interviews divided into three sections: Accomplices (his cohorts in the making of his films), Peers (other Italian directors of the period), and Victims (his actors and actresses). It is a nice collection of tributes and anecdotes of the man, and something Fulci fans will enjoy. WISIA: It’s dumb, but it’s fun, so yeah, even though it got a low score, I’d probably watch it again for kicks. Film: My journey to see this film is an unusual one. I heard a single track of Mark Korvan’s amazing score, I can’t remember where (it was possibly on the soundtrack-centric, and well worth listening to podcast The Damn Fine Cast) and had to grab the entire soundtrack, on vinyl of course! Korvan uses a bizarre mix of instruments, including the waterphone and the hurdy-gurdy, to create this soundscape that is bizarre and horrifying, but more importantly, intriguing. As soon as this was released on bluray, I was at my local retailer, eftPOS card at the ready! Was I disappointed? Not at all! 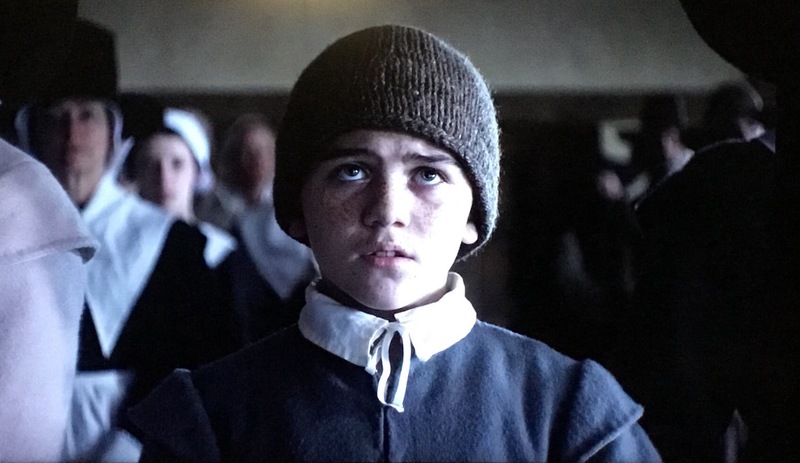 Set in the early 1600s in New England, The Witch tells of a family who are kicked out of a walled town due to their religious practices differing from the rest of the town. They travel a day by horse and cart away from the town and set up a small farm just outside a large ominous forest. The eldest daughter, Thomasin (Anya Taylor-Joy) is playing with the youngest child, a baby when it is snatched by something from right under her nose… literally. Her father, William (Ralph Ineson) and mother, Katherine (Kate Dickie) tell her and the other children, Caleb (Harvey Grimshaw) and twins Mercy (Ellie Granger) and Jonas (Lucas Dawson) to stay away from the forest. 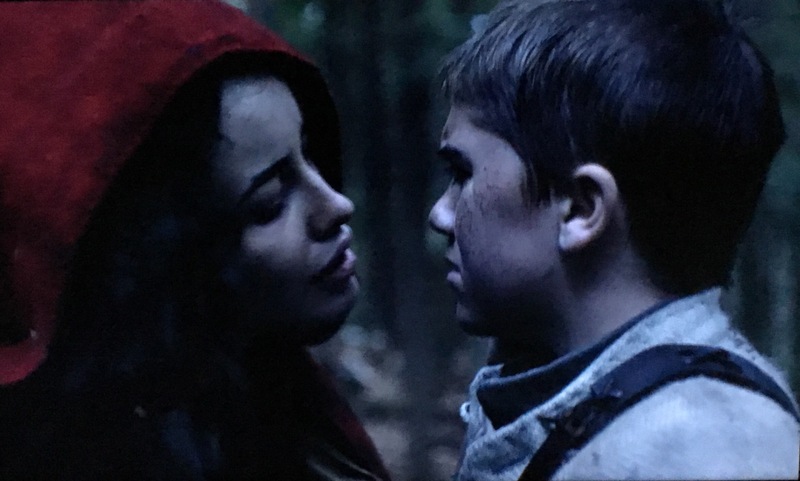 The isolation and the pain of the missing child start to form cracks in the family’s relationships, and when Caleb disappears, accusation of witch-hood start flying, but is the threat from within the family, or if there really something evil in the woods? Immediately I have to compliment this film on its visuals. 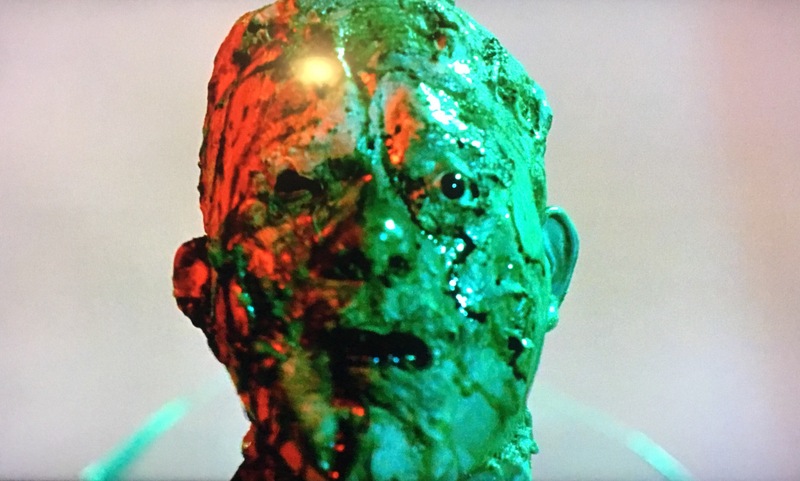 It feels ‘wet’ to watch, and there is this amazing, cloying, claustrophobic feeling throughout the whole film, and that’s an emotional claustrophobia as well! The acting is all top shelf, which is a great feat considering almost half the cast are young children (I don’t count the baby as one of them, I mean, the actor just played a baby… I hope they don’t get typecast!) and they had to contend with goats, which aren’t the most compliant of animals to have in a film. Also the whole film is performed in Ye Olde English, which takes a few minutes to acclimatise to, but once you get it, you completely understand. Writer/director Robert Eggars has created a complex film with a very deliberate pacing that is visually beautiful, audibly disturbing (with the aforementioned Korvan’s score) and leaves the viewer relieved with its freeing resolve after spending 90 minutes with a family whose religion and lifestyle is so oppressive. 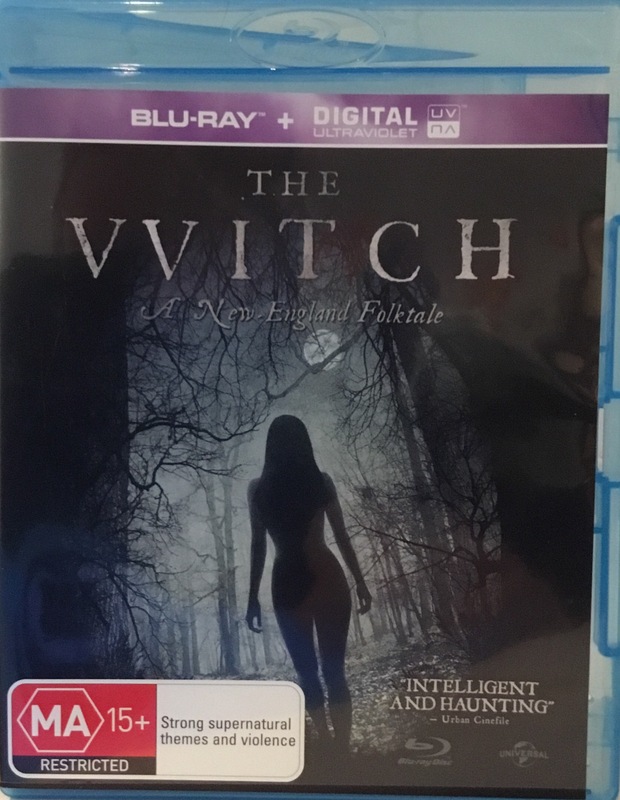 Format: The review copy was an Australian, region B bluray which also comes with an Ultraviolet copy. The film is presented in a quite beautiful 1.66:1 widescreen with an amazing DTS-HS Master Audio 5.1 soundtrack. WISIA: This is a visually beautiful, complex, repeat watcher if there ever was one. Don’t miss the GOMA’s latest film program ‘In Character’. 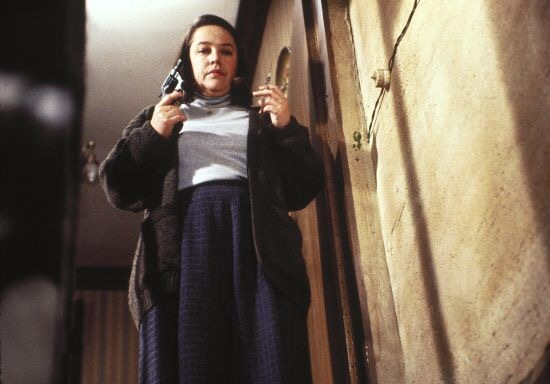 Screening until 28 August ‘In Character’ brings together an array of fierce performances by actresses who challenge our expectations for the behaviour, desire and physicality of women onscreen, including horror queens Kathy Bates (Misery 1990), Scarlett Johansson (Under the Skin 2013) and Catherine Deneuve (Repulsion 1965). To win a five film pass to use at the ‘In Character’ screenings of your choice, email competition@qagoma.qld.gov.au with ‘Scream Queen’ in the subject line by 12 noon Thurs 21 July. Winners will be contacted by 5.00pm the same day. Exciting news for heavy metal and Friday the 13th fans. 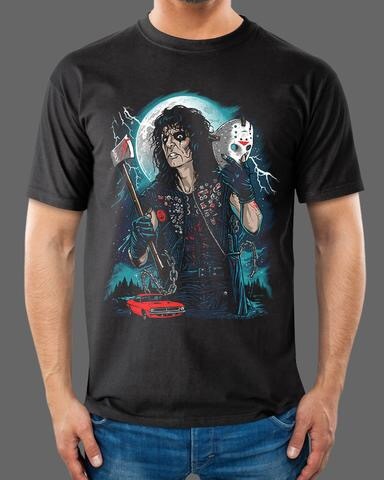 On the 13th of July, awesome t shirt company Fright Rags are releasing a series of brand new Alice Cooper t shirts, with a great designs by Ghoulish Gary Pullin, Christopher Franchi, Scarecrowoven, Kyle Crawford and Geoff May. 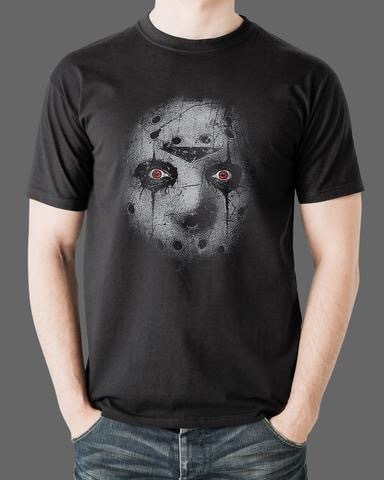 You can check them out at and order them at http://www.fright-rags.com . Film: In 2008, J.J. Abrams presented us with a film about an alien invasion, that really had one of the most amazing monsters that I have ever seen in cinema history, but for me it didn’t quite work as it used a cinema style that I detest: the so called ‘found-footage’ sub-genre. This is a sequel… Or is it? You’ll find that I am being deliberately ambiguous in this review as it’s hard to talk about without a massive spoiler, red alert light above my head. Read my synopsis and trust my resolve though, as you won’t be disappointed. The question is, is is this a movie about alien invasion, or something different with the name being the first in a series of clever sleight-of-hand trick to fool the watcher? Watch and you’ll find out! Mary Elizabeth Winstead plays Michelle, a woman who in her life tends to run from every thing the second in gets too hard; in this case, a relationship. She gets in her car and leaves him, but whilst in the run, she is involved in a car accident. When she wakes, she has her knee strapped, and I.V. plugged into her arm, but she doesn’t appear to be in a hospital… And she is chained to the wall. Very quickly, Howard (John Goodman) enters and tells her he saved her from the car accident and that he is continuing to save her by keeping her in a bunker as something has happened above ground. Michelle quickly discovers she is also being held captive with another man, Emmett (John Gallagher Jr.), but he actually wanted to get into the bunker as he believes he saw something, which he describes quite ambiguously. So we have Michelle, trapped with an ex Navy officer who is clearly suffering from a psychotic break, and a young man who may or may not be complicit in his psychosis, in a bunker to protect her from ‘something’ that has happened above… How will she survive? Will she get out, and if so, IS there actually SOMETHING out there? The first thing I have to compliment this film on is the absolutely perfect casting. The leads, Winstead, Goodman and Gallagher Jr play their roles perfectly. Winstead is delicate and resourceful, but not ‘my dad was an army ranger’ resourceful, instead it’s a realistic recourcefulness that comes from her desperation. Goodman’s portrayal of what appears to be a man suffering from some kind of horrific PTSD is so thrilling that from one moment to the next you just can’t tell how he’ll react to a situation. Gallagher Jr is good in his role too as Winstead’s maybe/ maybe not ally, and the evolution of his character is done well. For a first time director, Tractenberg has created an amazing film that is claustrophobic both physically and emotionally and contains some moments that are so sudden that even my old-seen-everything-can’t-be-surprised eyes went wide and my mouth hung open for several minutes. From a fine point, he uses some fantastic devices to notify of the passing of time, that are so subtle that they are almost unnoticeable, like Winsted’s nail polish going from perfect to cracking off. It’s not a definitive passing of time, but it’s just noticeable. Broadly, he has simply created a film that is a definitive thriller! This movie was like flipping your egg and finding out it was actually bacon. I’m not sure how many of you have read the book ‘Quake’ by Richard Laymon, but I got a huge vibe that was similar insomuch that whatever is happening outside is ambiguously deadly compared to the immediate danger from being trapped by/ with someone who has appeared to have somewhat of a psychotic break. The environment of the film is amazing too. 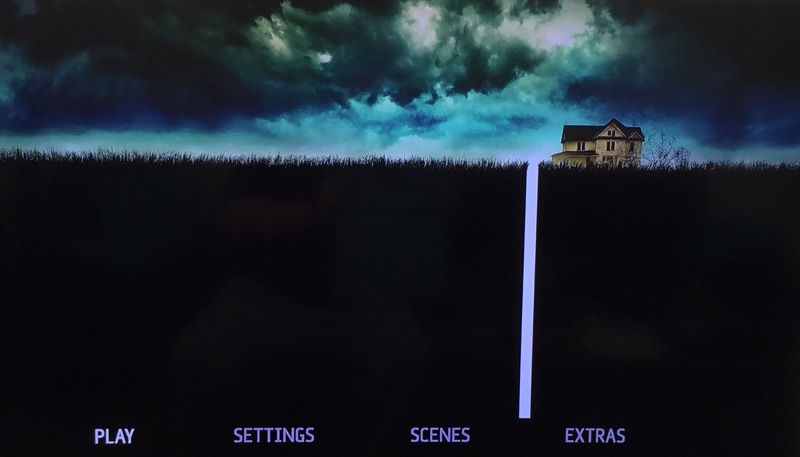 For three actors to spend 2/3 of a film in essential one set requires precise acting and direction to work, and work it does. The bunker is weird and lit wonderfully so that it all feels like a doomsday prepper’s actual underground domicile. It would also be remiss of me not to mention the wonderful score by Bear McCreary. It’s a traditional sounding score, but has layers to it that suit the film to a t.
I can see that some may compare this film to stuff like Captivity, but it has so many more levels, and when it does finally play its final hand, it shock is resounding. In one of the extras, a description says the film, and I’ll paraphrase, is like a bow being drawn for the first two acts, and released in the third, and that is the perfect description. Honestly it’s been a while since I saw a film that was actually thrilling, and this is just that. Don’t necessarily take this as a direct sequel to Cloverfield or a film that takes place in the same universe, but instead a film that exists next to Cloverfield but tells a different story. Honestly I think this is where the Alien franchise should have gone instead of focusing on Ripley, it should have focused on the threat/ potential threat of the unknown. Format: This is a modern film so one would expect that is would look and sound perfect, and it does. 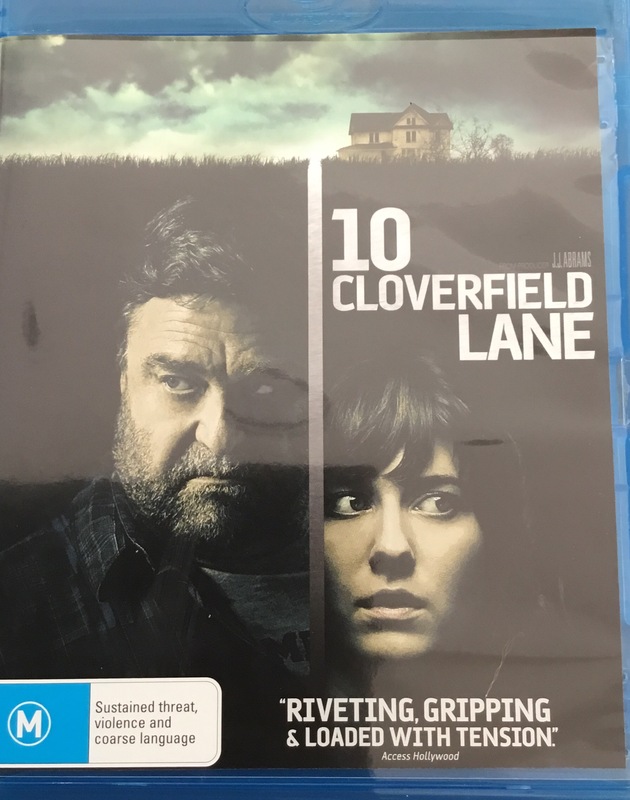 This is the Australian bluray release of the film and is presented in 2.40:1 widescreen with a Dolby 5.1 Atmos audio track. Extras: A decent pile of extras on this disc. First we have a commentary by director Dan Tractenberg and producer J.J. Abrahms which is an amazing introspective look not just into the making of this film, but filmmaking in general. A bunch of featurettes also appear: Cloverfield Too (looks at the ideas of the film), Bunker Mentality (looks at the construction of Howard’s bunker), Duck and Cover (about the design of the hazmat suit), Spin-off (looks at the practical special effects), Kelvin Optical (looked at the visual and audio effects department of Abrams’ Bad Robot Productions), Fine Tuned (explores the score by Bear McCreary) and End of Story (is really just a summation of the pervious featurettes). These featurettes essentially were great, but in my opinion could have been mixed together into one pretty awesome filmmaking documentary. WISIA: Even though the trick has played its hand, the performances give it a lot of rewatchability.